I love sandwiches at The Beat, but very few sandwich spots are batting a thousand. There's almost always gonna be something on the menu where things get a bit slippery. The idea behind the Slap & Tickle is a good one, mixing sweet and salty and spicy. But the execution isn't there. It's got organic peanut butter and homemade jam -- I believe it was strawberry in this case -- with smoked bacon on pan de mie. That'd be fancy French for completely unfancy white bread. I feel like there may have been jalapeno on the sandwich as well, but I could be wrong. Using such an ordinary bread is the first mistake. The second is the bacon. It wasn't crispy. Droopy, soggy strips of swine, even if there are some smokey, savory flavors, will never cut the mustard on a sandwich, particularly not when the other ingredients are sweet and gooey. Also, too much jam and not enough peanut butter. 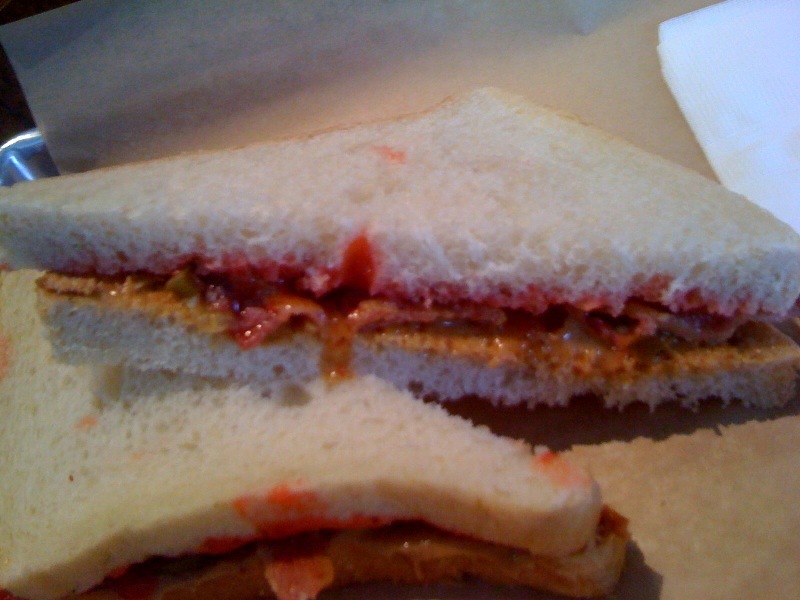 If you're gonna go crazy with a peanut butter bacon sandwich, you've got a pick a team: PB or piggy. Let one dominate and the other complement. This sucker can't make up its mind.